A Self Playing Show may be e-mailed, (you may have to remove the .exe and tell the recipient to add it back in as many virus programs and e-mail systems block .exe files) added to a floppy (size permitting) disk, a CD Rom or downloaded. The recipient needs only to click on the file to view the movie. Self Playing Shows are the easiest way to send movies to friends, family and colleagues. 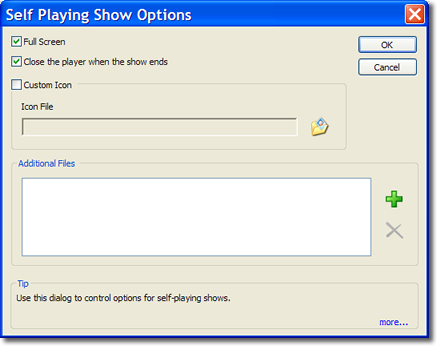 To create a Self Playing Show select Publish from the File menu and then select Self Playing Show. The Self Playing Slide Show dialog will appear. This is a standard file box that will specify the name and location of the Self Playing Show .exe file. After a name and location have been entered the Self Play Options dialog appears.